One interesting aspect requested recently was the ability for a user to quickly see, when looking at an all record view the stage a record is at in the business process flow. That would make it easier for users to not only see quickly where their records are, but also have the ability to filter for only records at a particular stage to focus on. This can be achieved easily, with a no code configuration. Let’s see how. First off, I’ll be making the assumption you already have the Business Process Flow created. If not, go ahead and create it. Mine has 3 stages: Collect, Review and Conclude. You could show this field on the form if you really want to, or just leave it off the form. You only need to show it in the all records view. Next, go ahead and create a workflow. Depending on your need, you could leave it asynchronous, or make synchronous. 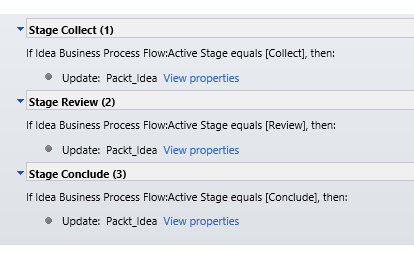 Set the Entity on your workflow to the Business Process Flow you will be monitoring the steps on. For triggers, select the Start when to Process is applied and also to Process changes –> Active Stage. this will trigger an execution both when the record is created (Process is applied), as well as when the step changes. Finally, go to the all records view, and add the Process Stage text field. Now, when you create a new record, or change the process stage, the workflow is triggered and the all records view shows the updated stage for each record. This is just a simple configuration to quickly get the relevant info in front of the users.